This is a very special #WeddingWednesday for us here at Mikaella, as we have a guest blogger joining us for the next few months. Deidra, a Canadian bronze medal-winning Olympian, has just found her perfect wedding dress (yes, it’s a Mikaella!) and has graciously offered to share her wedding experience with us. Every month from now until her spring wedding, Deidra will be giving us a glimpse into her pre-wedding plans, paired with some advice along the way. As a young girl growing up in Red Deer, Alberta, I don’t ever remember myself dreaming of my wedding day. I had one dream, it was all encompassing and crystal clear: I wanted to be the best freestyle skier in the world. Olympic gold. I spent so much time singularly focused on my Olympic dreams, I hardly contemplated love, marriage and my future after sport. I lived everyday working toward a 4 second opportunity that arose every 4 years. Fast forward 15 years and here I am in Toronto: an Olympic bronze medalist, a 2-time Olympian, a lawyer and most rewarding, a finance to Tyler and puppy parent to our mini-golden retriever Dublin! I met Ty in 2012, I was a law school intern at a sports union and he was the director of International Business. I hardly spoke to him, we were close in age but seemingly, miles apart in life. It wasn’t until a mutual media friend connected our lives outside of the office that I felt a spark. I wanted to know this man. I found him attractive AND interesting. From the very beginning it was different from anything I’d ever experienced. I remember walking down the street holding his hand, it was probably only 2 or 3 weeks into dating, and I knew I was in love. At 30 years old, I’d never been ‘in love’ before. I couldn’t believe how deep, raw and vulnerable I felt. How quickly life visions, aspirations and goals changed from ‘me’ to ‘us’. 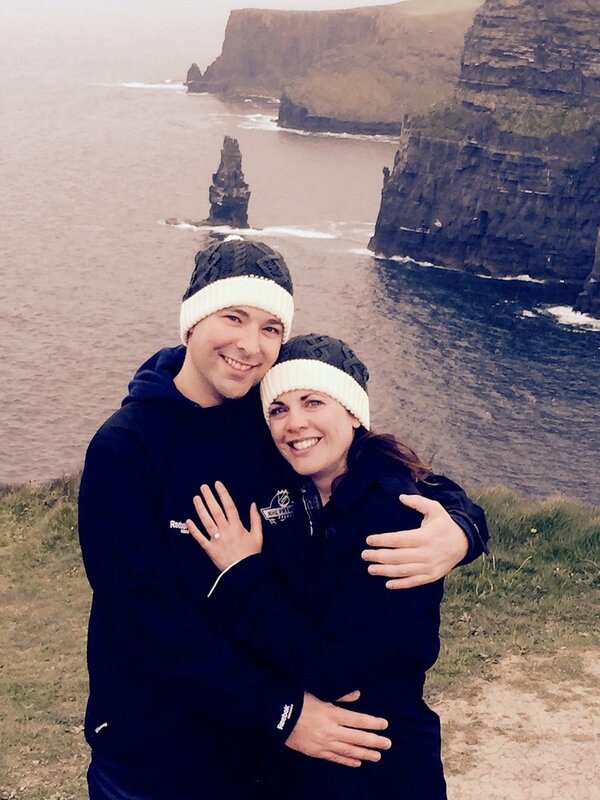 Last May, overlooking the Cliffs of Moher in Ireland, Ty surprised me and got down on his knee to ask me to marry him. Before I could even speak, tears of happiness flowed. No moment in my life could compare to the pure joy I felt in that moment. No jump, no podium. It was pure bliss, pure certainty and belief in our future. My new goal: plan a wedding that reflects who we are and celebrates our commitment to one another. My challenge: find a dress that both wow’s my husband to be, captures who I am and importantly, doesn’t break the bank! Hope you’ll enjoying sharing in my experience! As a Canadian company, we are especially honoured to have such an inspirational Canadian role model choose one of our wedding dresses, and we can’t wait to share this experience with Deidra! Be sure to check our blog again next month as we’ll be featuring more of Deidra’s journey, from finding her perfect Mikaella wedding dress, to walking down the aisle, and everything in between.